It's no secret that physical and mental stress can have serious consequences for your well being. It shouldn't be surprising, then, to learn that researchers have found that working as a police officer can contribute to health problems. To combat the health hazards that come with policing, individual officers and entire agencies are looking to wellness programs for police and other criminal justice professionals. According to the United States Department of Health & Human Services, wellness programs are plans employers - like police departments or corrections agencies - can offer to their employees to encourage and promote healthy lifestyles. Usually, they consist of incentives for healthy choices. They might also mean consequences for poor health choices. An employer might offer plans to help members stop smoking, free gym memberships and weight loss programs to their employees. They may also include rewards - like extra money or vacation days - for officers who meet or exceed health goals. In short, wellness programs are designed to help keep workers healthy. Because of the physical rigors and stresses associated with criminal justice work, police and corrections officers can face a variety of health issues throughout their careers. Besides health issues, though, officers really need to be in good physical and mental health in order to do their jobs to begin with. Criminal justice agencies spend hundreds of thousands of dollars sending their applicants to physical fitness assessments, medical exams, and psychological evaluations. Once hired, though, that's often the end of the focus on officer health. In the meantime, many officers combine poor eating habits, physical and mental stress, and the fatigue that comes from long hours, overtime programs and shift work. All of that contributes to deteriorating health and, consequently, a less capable and reliable workforce. What Can Wellness Programs Do for Police Departments? The United States Centers for Disease Control cite multiple studies that detail why wellness programs make good business sense for employers. Specifically, they've been able to show that healthier employees tend to be happier, which in turn makes them more productive. Even more significant for law enforcement and corrections departments, though, is the fact that improved employee health reduces absenteeism and on-the-job injuries. That means more people are coming to work and staying at work as opposed to calling in sick. Further, if people aren't getting hurt at work, it means that not only are they able to continue being productive employees, but those employers have fewer liability costs that come with on-the-job injuries. Perhaps more importantly, though, is the fact that people who work for agencies with robust wellness programs tend to feel better about their employer. They report a sense that the agency really cares about them, and because of that, they're more likely to keep working for the department instead of looking for jobs elsewhere. This can go a long way toward relieving the problem of turnover and employee retention in police departments. Why Should Officers Want Wellness Programs? Officers should want to work with their agencies to promote wellness so they can stay healthy and live longer. Criminal justice careers are dangerous enough without the added problems of poor health. Officers should be interested in taking advantage of any program that can help them survive the job. Police and corrections officers who remain healthy throughout their jobs are in much better shape to enjoy what life may bring to their careers. 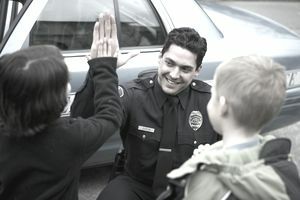 Wellness programs for criminal justice professionals can ensure officers enjoy long and happy retirements as their rewards for a good job done well.